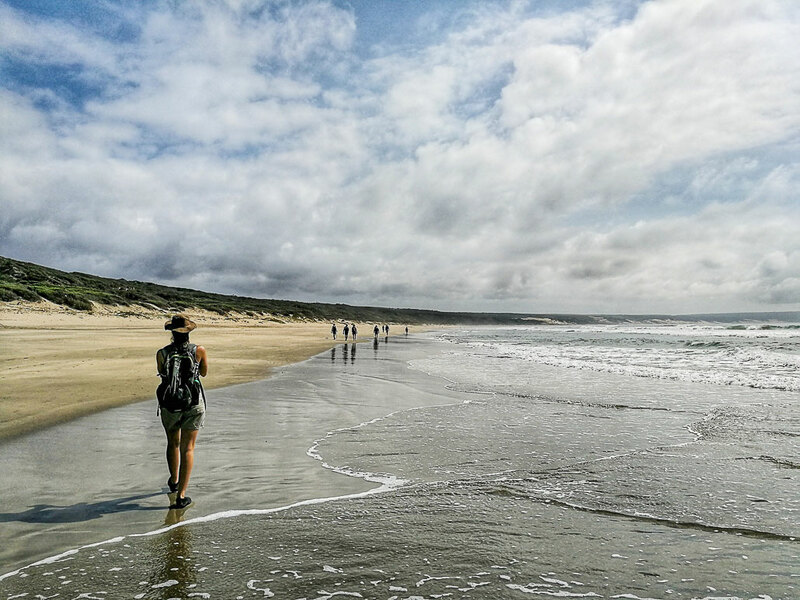 The Oystercatcher Trail, named after the vulnerable African Black Oystercatcher that is prevalent along the route, is a five-day guided hike along the southern east coast of South Africa, starting in Mossel Bay and ending at Gouritsmond. However, depending on tides, it is not always a single-direction hike. Only three of these days are spent walking, with an orientation day as day one, and a final breakfast and a transfer back to vehicles on day five. Beauty: 3.5/5 – Shoreline hiking at its best. The peri-urban aspect detracts slightly from the coastal magnificence. Difficulty rating: 5/10 – Without any real inclines or declines, and the option of slack-packing, this trail is more than manageable for most. Be warned, however, that the distance covered each day is substantial and those less fit will have weary legs after a solid day of walking. Technical rating: Easy to moderate standard, guided walking, mostly on-trail. Day 2 and 3 both have long portions of the trail on soft beach sand, which is tiring, and Day 3 has some boulder hopping. 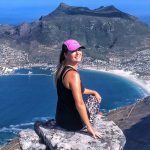 Upon a late afternoon arrival, the first evening is spent at Ana’s Place apartments, a four-star apartment high on the hill overlooking views across Mossel Bay town and harbour, and the British-styled beach pavilion near the ocean. Here, the group was introduced to one another and shown around the apartment, and thereafter left to our own devices for an hour or two. We later reconvened to meet and have a short debrief with our guide, a gently spoken ex-Zimbabwean called Chris, as well as the relevant Oystercatcher team members, including nature conservationist intern Katherine who would be joining us for the trail. The team handed out maps, brochures and wine, and we passed a companionable hour together chatting and being briefed on the trail. The group was then collected and taken to a local restaurant, owned by none other than Louis Oosthuizen – the local golfing hero. We had a tasty dinner and got to know each other better – the evening was spent telling hilarious stories about what to do with pesky lice-ridden pigeons that roost on one’s roof and sharing war stories about back operations (half of the group had had the same back operation)! The group was made up of three separate bookings, but the camaraderie was immediate. Once again, I was reminded that, generally, all hikers are wonderful humans with much in common. 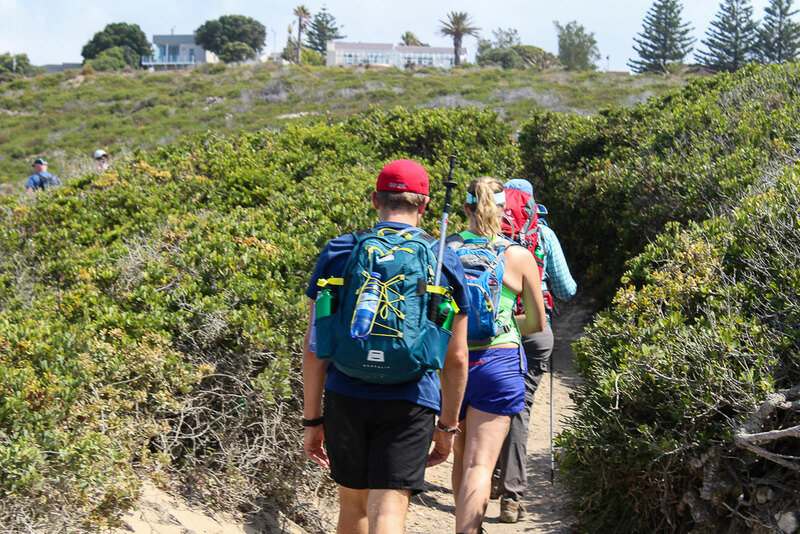 The hiking group, made of three separate bookings, at Ana’s apartments in Mossel Bay (Image: Dania Petrik). The morning started with a delicious continental breakfast at Ana’s Apartments, where the group debated whether we should make use of the optional tour to visit the famous Pinnacle Point caves – the world-renowned Point of Human Origins (affectionately called ‘POHO’ by the Oystercatcher team) – at an additional cost. 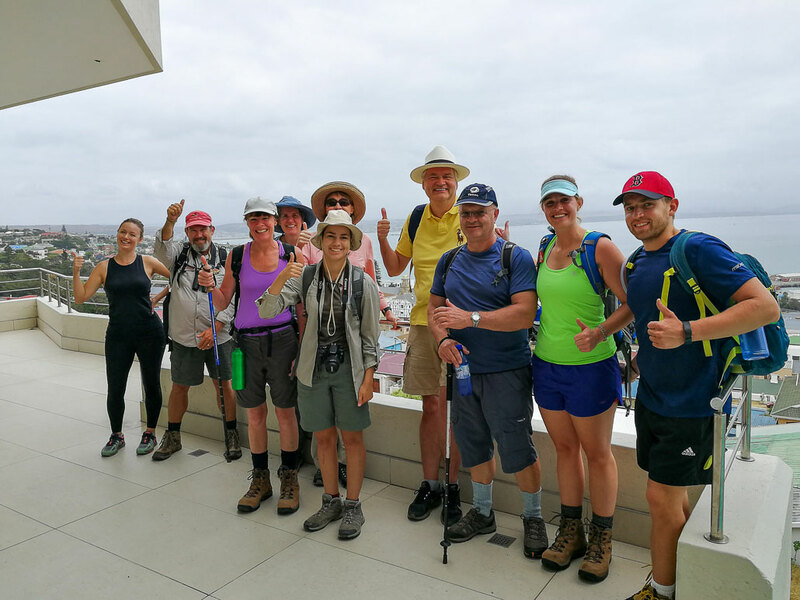 While most of us felt ambivalent, one group member was adamant – the POHO was part of the reason he had booked the Oystercatcher Trail; and so, in order to avoid splitting the group when the time came, we all decided to join him then and there (and luckily so)! The trail starts at Ana’s Place, and for a short distance one walks through the residential area before popping out at the start of the St Blaize trail. Here, Chris showed us the abundance of archaeological artefacts lying underfoot! 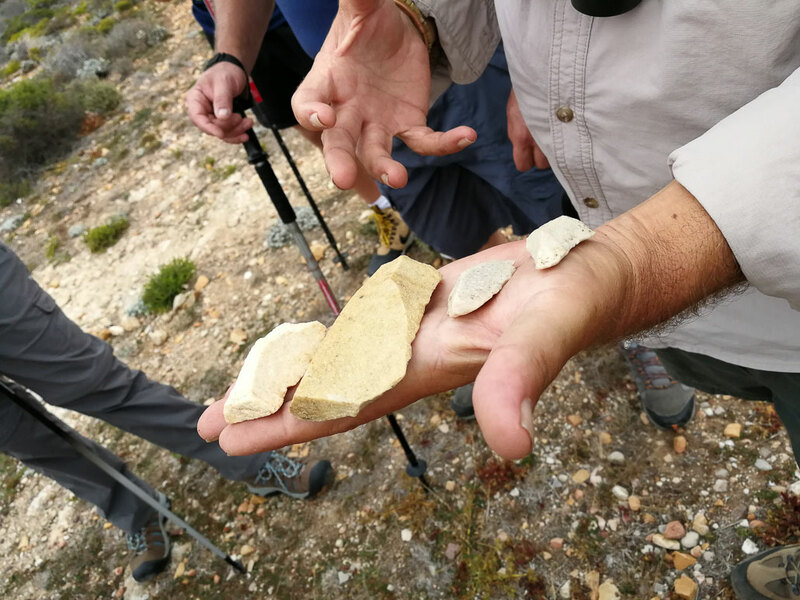 Chris, our guide, showing us evidence of early human technology in the Mossel Bay area – here he is holding rudimental blades (Image: Dania Petrik). While the St. Blaize trail runs along the edge of orange lichen-covered cliffs below the residential area, and the views out to sea were spectacular, I was distracted by the thickets of ‘rooikrans’ (an alien tree brought from Australia) that lined the path. One can see that efforts have been made to clear some areas and allow the natural fynbos to grow back; however, it is a ferocious plant and without sustained and concerted efforts, it was obvious to see that even in the cleared areas it was growing back with fervor. Chris was knowledgeable on the topic, and spent some time explaining the relevant sides of the story to us. Walking along the cliffs below the residential area on the St. Blaize trail (Image: Katherine Venter). The day’s walking was essentially done when we arrived at the Pinnacle Point Golf Estate, where we had a refreshing drink before meeting our cultural guide (another Christopher!) who would be taking us on a tour of the POHO caves (13a and 13b to be exact). 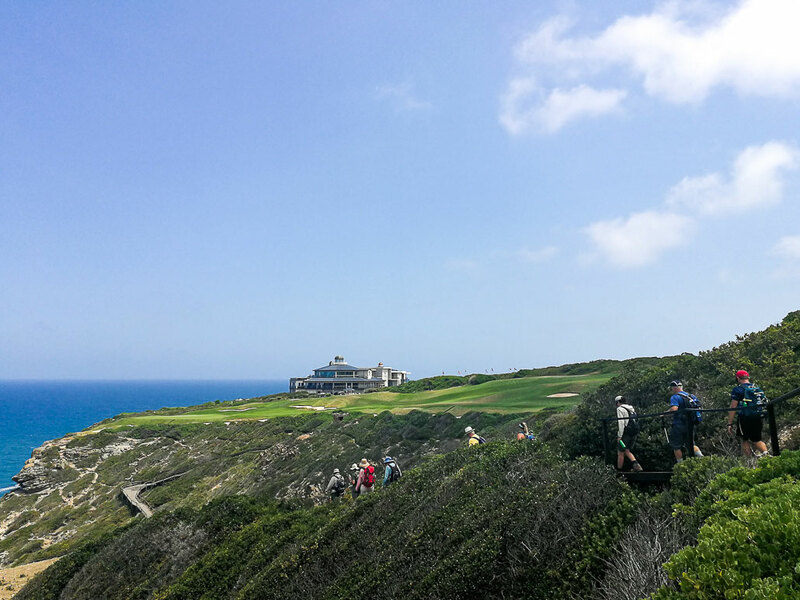 Our hiking group enters Pinnacle Point golf estate with its famous clubhouse (Image: Dania Petrik). First, our guide gave us an overview of the history of the area and its archaeological importance, explaining how the climate had changed the entire geography of the area over eons and the significance of the archaeological site and findings, believed to be 164 000 years old (and the discovery of the earliest human ‘technology’ of the middle stone age era). 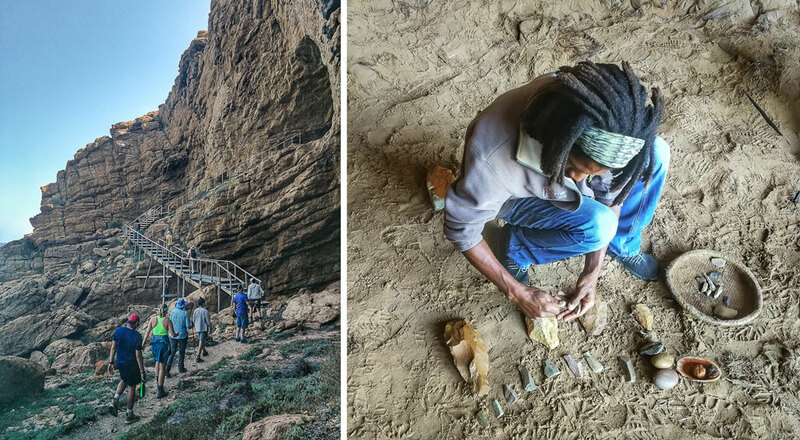 We then climbed the 175 stairs down to the caves, where Christopher spent time pointing out the exceptional geology of the caves. In the first cave (13a), several large buckets stood spaced apart, catching drained water from the roof and sides of the cave. Here, he explained, irrigation water from the golf course above was slowly seeping into the caves, creating a green slime that was reacting to the particular mineral composition of the cave. Left: Christopher, our POHO guide, leads the tour group towards cave 13b (Image: Dania Petrik). Right: POHO guide Christopher showing us the middle stone age tools discovered in the Pinnacle Point caves (Image: Dania Petrik). In cave 13B, archaeologists have found the earliest evidence for exploitation of marine resources (shellfish) and symbolic behaviour of Homo sapiens, such as the use of ground ochre presumably for body painting or rock art. 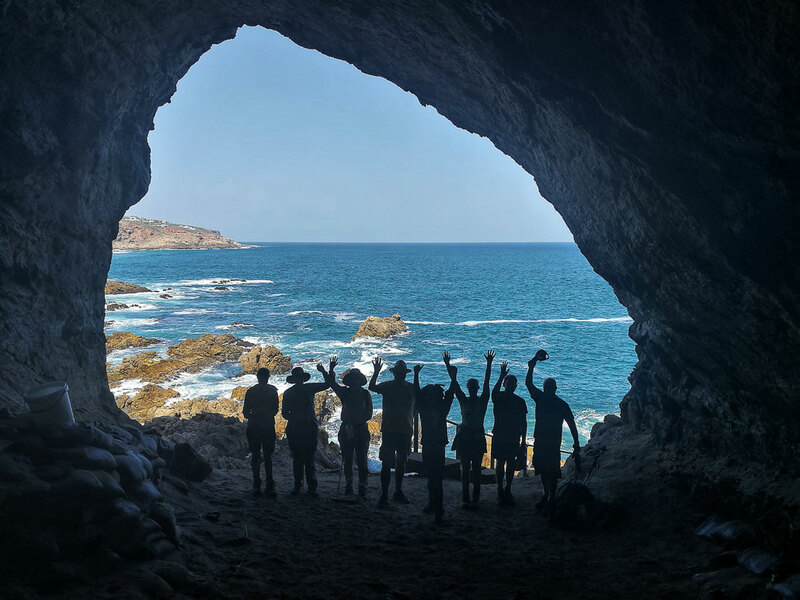 The hiking group silhouetted against the entrance of cave 13b (Image: Dania Petrik). After the POHO tour, we were picked up by transfer, and taken to the accommodation where we would be staying for the next three nights, Sandpiper Cottages in Boggomsbaai. The accommodation for each member or couple was simple but spacious, considered and private, with small, personal touches that made it that much more comfortable. It was great to be able to unpack (knowing we would not be relocating to different accommodation the following nights) and have hot showers before meeting again for dinner. 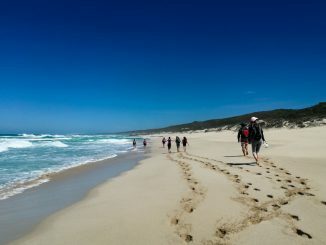 Starting out on the beach at Boggomsbaai (Image: Dania Petrik). Chris had estimated that high tide would be coming in at 2pm, which would make our walking exceptionally difficult in the last half of the day, with conditions akin to walking in sinking sand. 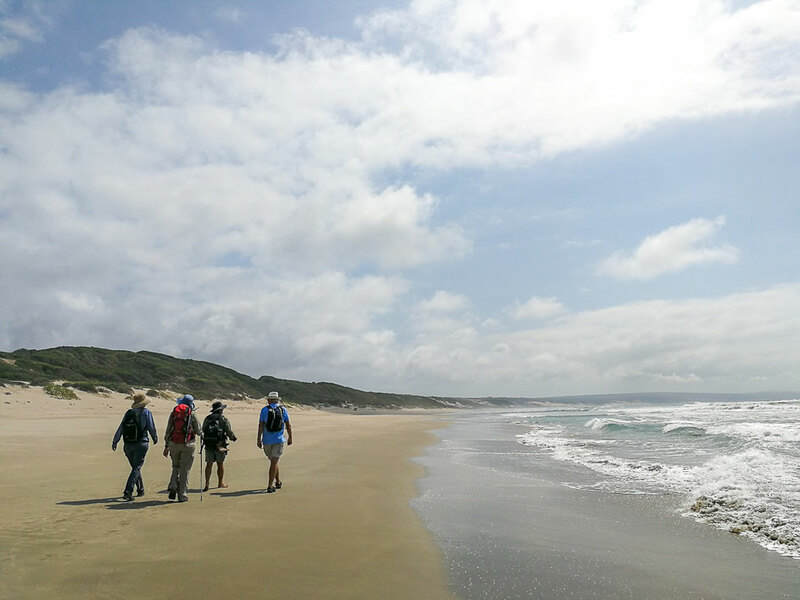 With that in mind, where Day Two would usually begin in Dana Baai and end at Boggomsbaai (walking in a southerly direction), our group began Day Two of the Oystercatcher Trail on the Boggomsbaai beach and walked north-east towards Dana Baai. This was because of the location of a great lunch spot on a river that, in terms of distance, fell into the last third of the day in this direction – where we could swim and wait out the high tide, finishing the last few km’s in the late afternoon. 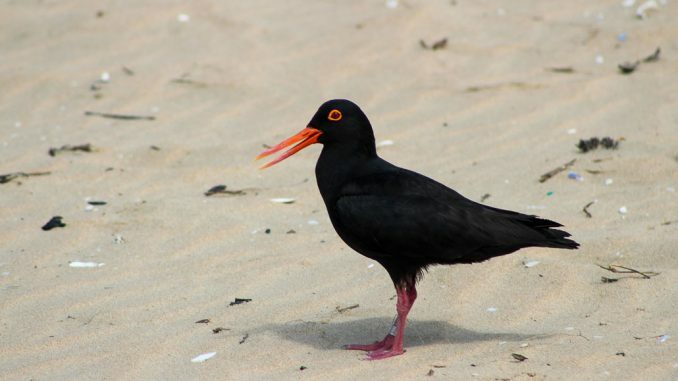 Save for several pairs of nesting African Black Oystercatchers and flocks of wheeling gulls, the beach was isolated and expansive, the curved bay disappearing far into the distance. If one kept your eyes on the horizon, it felt like the most pristine beach in all the world. However, we couldn’t keep our eyes from drifting to the sea-tossed collection of sun-burnt, bleached plastics and rubbish that littered the sand. Without any discussion, our group unanimously began picking up each bottle, each nuble and each tiny piece of plastic packaging. 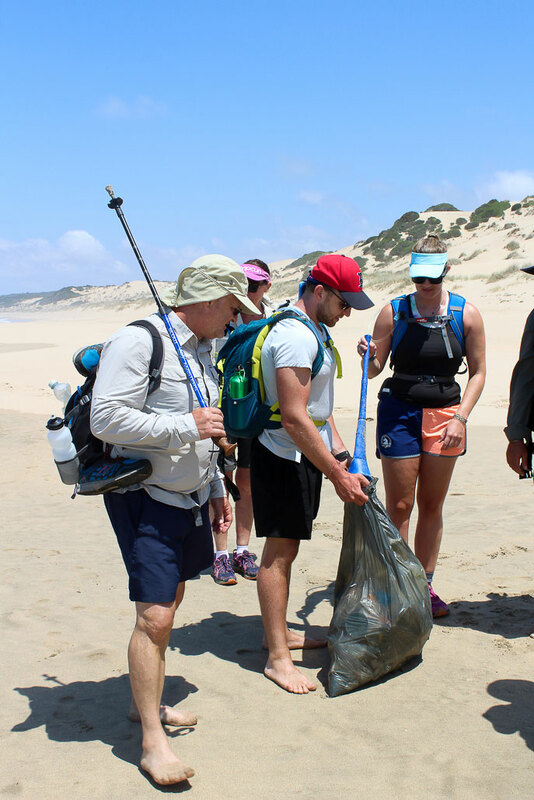 In my experience, not all hikers fully appreciate the link between litter and the preservation of our wild spaces; it was a relief to be walking amongst those who implicitly did and to feel the sense of camaraderie grow as the rubbish bag did. It always feels like an overwhelming task once you begin, yet picking up one piece of plastic that doesn’t belong on the beach or in the ocean might mean one less precious marine animal that dies from plastic ingestion. We reached the estuary – our lunch spot – after a good four hours of walking. This was a lovely reprieve, a mere kilometre or two from the end of the walk on Day 1. It gave our group a chance to rest, eat some lunch and have a refreshing dip in the estuary. 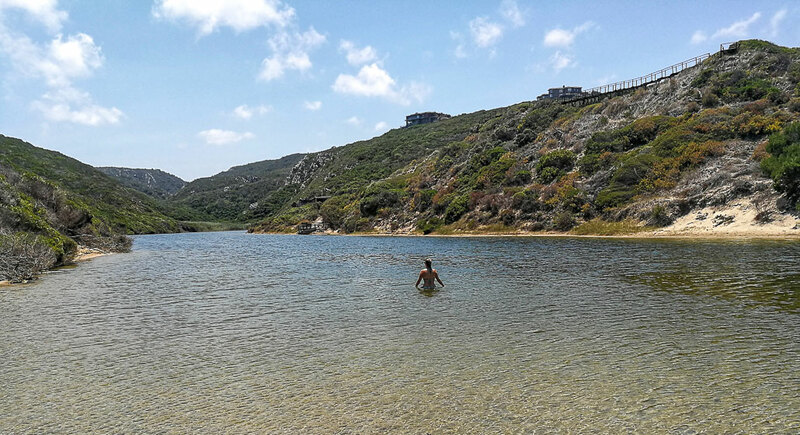 Swimming in the invitingly luke-warm, clear waters of the estuary (Image: Dania Petrik). 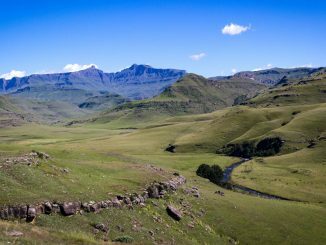 Looking back towards Boggoms Baai at the end of the day (Image: Dania Petrik). 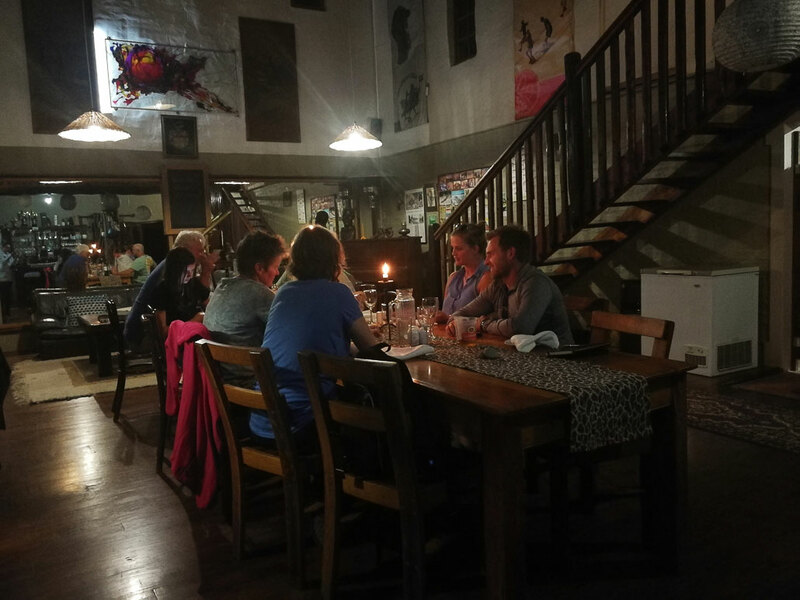 The day ended with our transfer collecting us and returning us to the accommodation, where we had a few more hours to relax before congregating again in the communal dining area for a delicious hot meal. The promise of rain (Image: Dania Petrik). 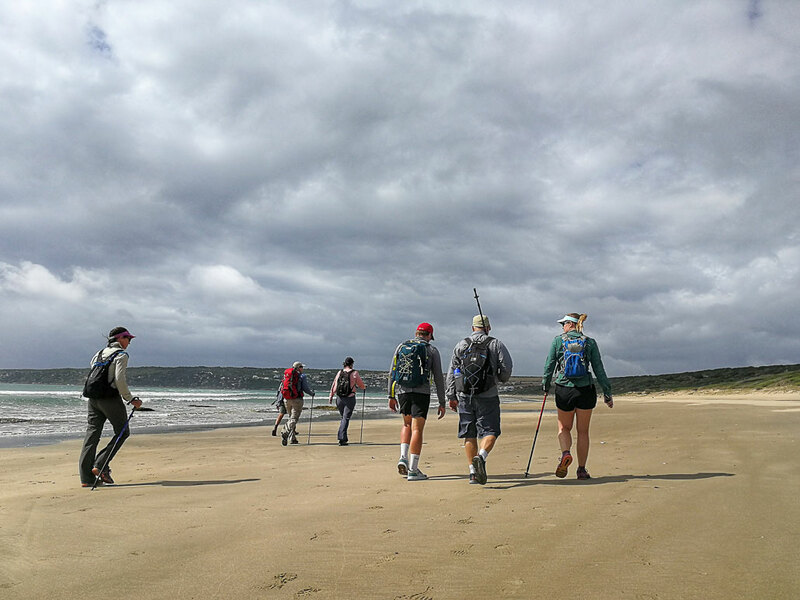 A moody sky greeted us as we began our trail on Day Three; a day that would see us walking from Boggomsbaai to the serene Vleesbaai, and onwards to two tiny nature conservancies – Fransmanshoek and Kanon Private Reserve – before we arrived at the end of the trail at Gouritsmond. 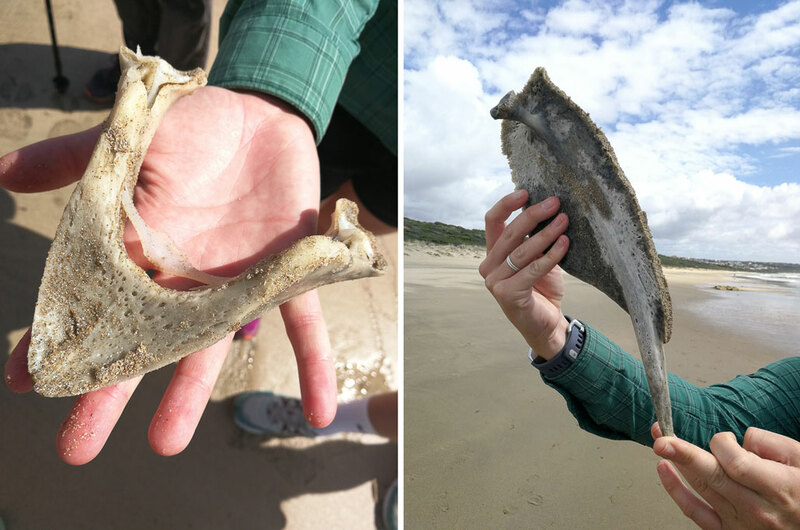 Along the short walk on the beach from Boggomsbaai to Vleesbaai we came across a fascinating find – strangely shaped, sea-weathered bones that could only have come from a large turtle! Turtle bones (Image: Dania Petrik). Despite the threatening skies, the day was balmy and the views exquisite. 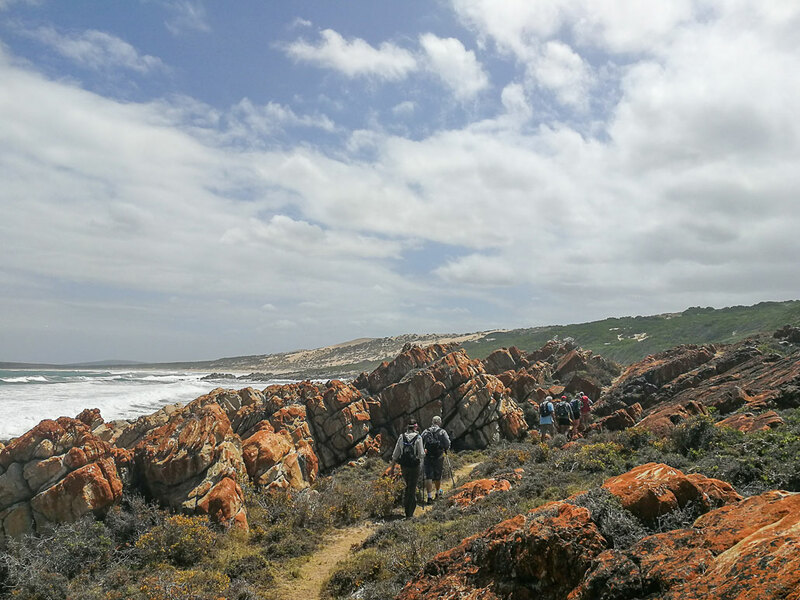 The trail takes one from the beach, to a rocky shoreline after Vleesbaai where some balance is needed for boulder hopping along the large rock-strewn coast. 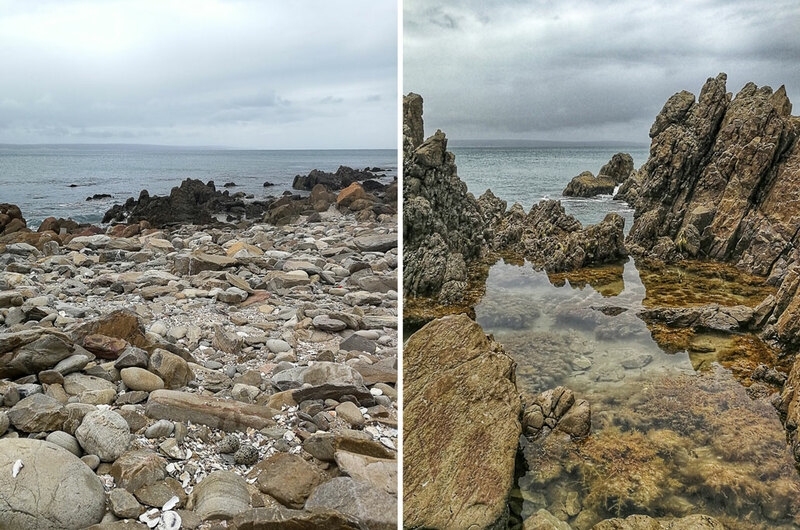 All along the way, stops were had as Chris and Katherine pointed out several amazing discoveries – from trail-side ancient middens to the red-legged Oystercatcher nests where perfectly camouflaged eggs blended into the surrounds. Here, the warning, high-pitched ‘keeee’ of the parent birds followed us until we were suitably admonished and well past their sheltered nesting ground. The team stopped for a warm, home cooked lunch delivered by the chefs themselves at Fransmanshoek, and enjoyed the beautiful views across the Indian ocean while we ate. The striking coastline of Day 3 (Image: Dania Petrik). 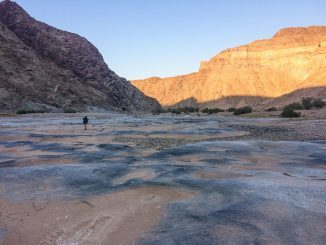 It was a welcome respite, but we were soon on our way – passing bright lichen-covered rocks while weaving our way between sand dunes and the shoreline, before arriving at a long stretch of beach. Here, the high tide was just retreating, and the sand was soft and boggy, but the beach was bordered by untouched dunes and coastal vegetation and the views out to sea were expansive, making for tiring yet rewarding walking. 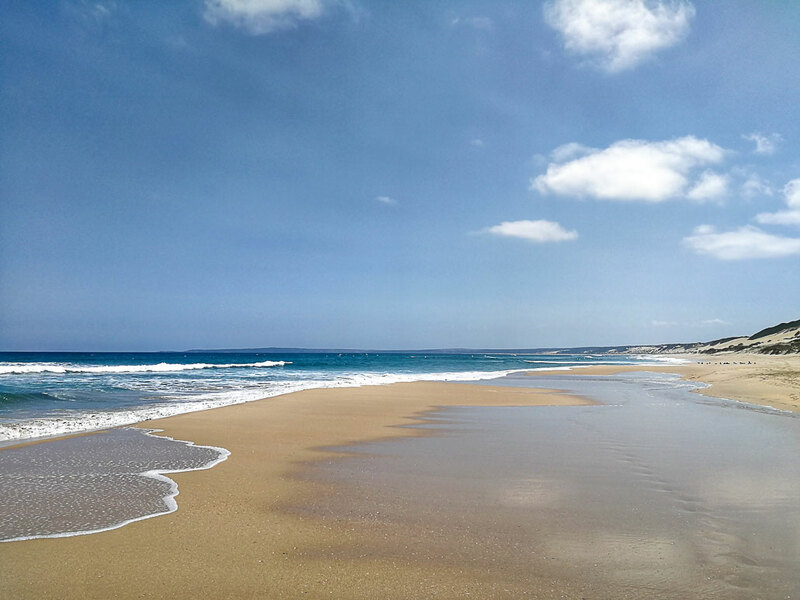 The beautiful beach-traverse towards Kanon (Image: Dania Petrik). Just before the few houses at Kanon appeared, we stopped to dip our feet in the water and have a short reprieve. Kanon Private Nature Reserve has one of the few remaining patches of Gourits Coastal Dune Thicket vegetation which is in a pristine condition, making it an important conservation area of our coastline and serving as an important benchmark for comparing disturbed areas against. From here, there were a short 3km’s to the Gouritz river mouth, where the trail came to an end. We were picked up by a little ferry and taken across the broad river to our waiting taxi driver, who transferred us back to Boggomsbaai and Sandpiper cottages for our final evening. The last team supper (Image: Dania Petrik). Some sections of this last day of hiking were quite technical, and the day was long – all bodies were aching and tired by the end of the day. We enjoyed a last ‘braai’ together while Fred Orban, local legend and the founder of the trail, regaled us with tales. The trail came to a close the next morning when we were once more picked up by taxi and transferred back to our starting point in Mossel Bay where numbers and hugs were exchanged as we said fond goodbyes to each other, having shared many laughs and good conversations, and a few precious days exploring our wondrous coast with kindred spirits. Orientation Day (Mossel Bay): Look for the historical homes built from sandstone rocks on your way to and from dinner. Note that this is essentially the only afternoon you will have to explore Mossel Bay itself. It is worth arriving early and taking a walk down to the pavilion or having a look through some of the interesting shops near to Ana’s Place. This is also the only time that you will have to do any last-minute shopping for snacks – while all meals are extremely well-catered for (and well-balanced), it is worth popping to the shops to get ‘preferred items’. The Oystercatcher Trail is exposed at all points and the last day of the Oystercatcher Trail in particular is long and will take several hours to complete. Ensure that you wear a broad-rimmed hats and long-sleeve shirts/pants to prevent sunburn, and that you have plenty of water for hydration. Carry sunblock for protecting exposed places like hands and necks. While some parts of the trail are relatively isolated and pristine, other parts would be classified as ‘peri-urban’ walking. If you want a complete detox from the rat race, this trail is probably not first choice. Having said that, your hosts at the Oystercatcher Trail will do their utmost to look after you and ensure all your home comforts are not missed – meals are hearty, tasty and filling, accommodation is simple but cosy, and your every need will be catered for. The guided aspect of the trail is a fantastic element and the knowledge and company of Chris and Katherine added hugely to the trip. 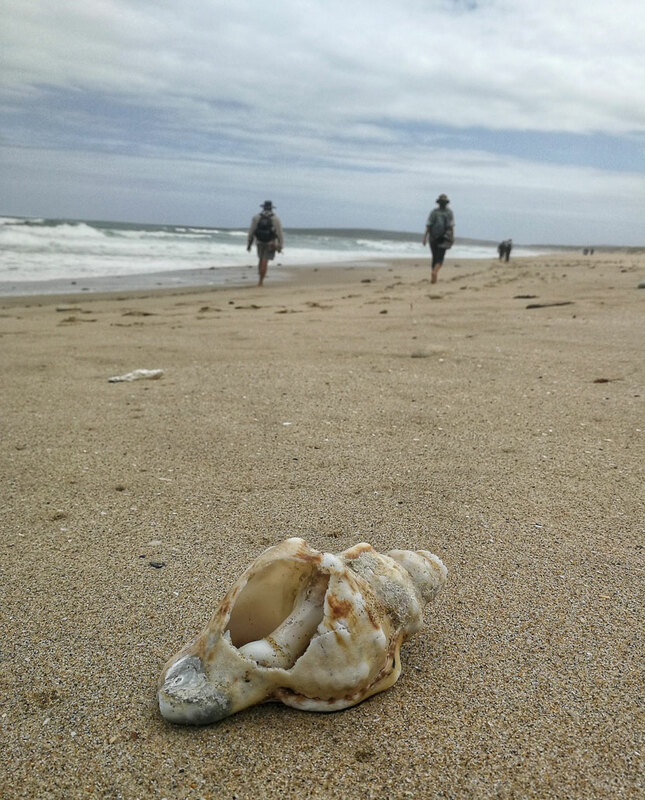 To have not one, but two such experts on the trail to point out historical artefacts and know so much about our coastline’s natural biodiversity – plant, marine, bird and animal life – was of immeasurable value. 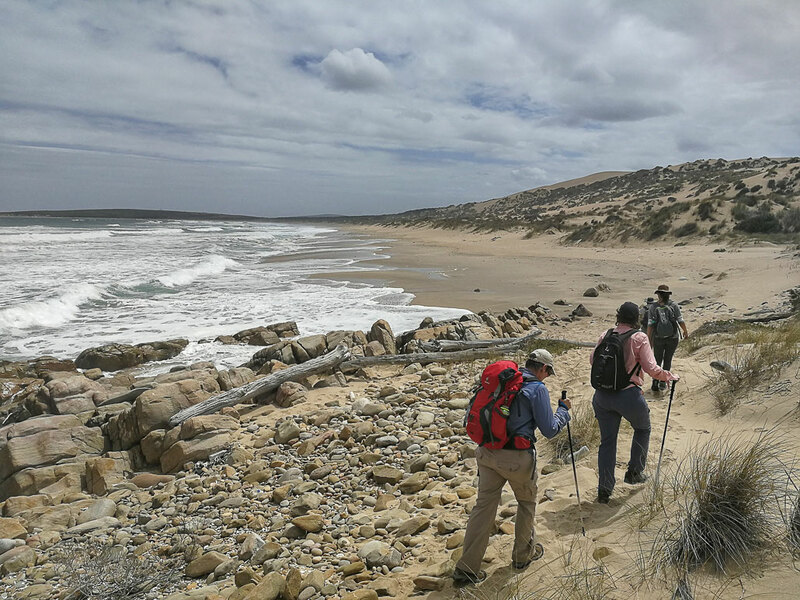 In addition, their understanding of the coastal environment (such as tides and currents) was of utmost importance to the actual trail both in terms of timings, direction of travel, and navigation along the route. I cannot recommend them more highly. Explorer of local places and wilderness spaces, aspirant Instagram celebrity.